Applicants must be 18 or over. Applicants should have their own means of transportation and meet state insurance requirements. Knowledge of classical music is suggested, but is not a requirement. 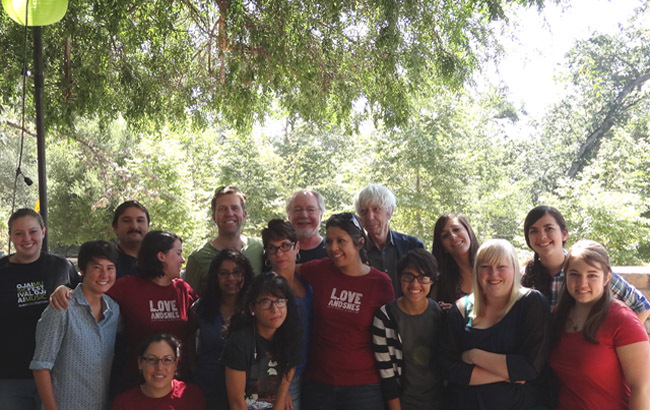 Interns commit to 2-3 weeks in Ojai and must be available during the Festival week (June 9 – 16, 2015). Please indicate on your application if you have special schedule requirements. Submit two letters of recommendation – these can be sent with the application or to the office directly. Education Interns work with the Education Coordinator to produce the informative lectures, talks, and film screenings that occur throughout the Festival weekend. A good fit for: interns interested in gaining experience in event coordination and gaining experience in patron interaction. Operations Interns work with the Operations Director on producing the Festival experience in Libbey Park and the Ojai Valley at large. Among other duties, they coordinate and schedule vendors, set up lighting and signage, and help to arrange artist housing. A good fit for: interns interested in gaining experience in event coordination and logistics. The Production Intern is also each year’s Stephen Rothenberg Fellow. The Production Intern works with the Festival Producer to coordinate artists and their needs throughout the Festival. They also work on stage and with the Stage Manager to help produce the Festival’s concerts, manage rehearsals and performances, stage changes, and coordinate between lighting and sound engineers. A good fit for: interns interested in gaining experience in concert production.